You’ve launched. You now have loads of content on your blog. You’re happy with the growth and the traction you’ve gained. Your audience is growing — not as fast as you’d like, but you’re meeting goals. Things are looking up because you’ve created authority with what seems to be a solid and loyal audience. But the rush of new content ideas is slowing, and enthusiasm (both yours and your audience’s) is cooling. 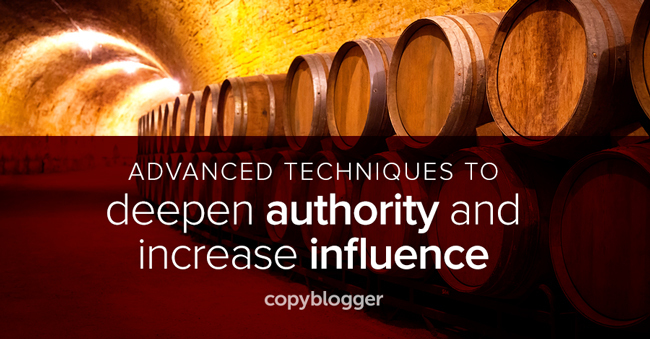 You’re worried about sustaining the momentum while deepening your authority and influence with your audience. And there’s a really good reason why this is a significant concern. According to Colleen Jones, the demand for evidence of your credibility diminishes as your authority grows. In other words the more people learn to trust you, the less they depend upon investigating your every claim. This is what a solid reputation does. But in order to keep that momentum and deepen that influence, you’ve got to adjust your content strategy to reflect the new demands of your audience. Let’s explore five ways to do that. 1. How does your audience find your content? This is one of the most important questions you’ll ever answer when it comes to your content. You might think you know this answer, but don’t take it for granted. Crack open your Google Analytics and dig. Naturally, one of your biggest drivers of traffic will be search engines. And Google will probably be the main source. However, don’t settle. Keep digging. You might discover that Bing is throwing you a nice number of readers. Or you might discover it’s some niche search engine. Try to find out why. There might be an opportunity you can leverage. The second biggest source of traffic will probably be social media. But which sites: Facebook? Twitter? StumbleUpon? Reddit? LinkedIn? Make sure you know the difference between links you share on social media versus those shared by your audience. You want to get a handle on how shareable your content is. You can look at the analytics of your social media traffic by using tools like Bitly or Buffer. Third, measure the traffic you get from people who type in your URL. This is what Gawker calls branded traffic, and it’s a good thing. It means you’ve captured mind share. Closely related is the amount of traffic you get from people who type in a specific headline. This is another version of branded traffic, and equally important because it helps you identify those pieces that people like and share so you can create more of these winners. Finally, look for sites that send you a lot of traffic. This traffic may come from sites where you published a guest post, or from a site that syndicated one of your old articles. If you are getting a lot of traffic, then clearly the topic was a winner. Generate more content like that. 2. Can you fix old, broken, and neglected content? There are a number of good reasons why you shouldn’t ignore old, broken, and neglected sections of your website. Updating content keeps your site fresh, and enhances the user experience. To learn more about this topic, read A Brief Guide to Fixing Your Old, Neglected, and Broken Content. 3. How does your audience take action? This depends on your stage of business development. For example, in the early months of the Copyblogger blog, Brian Clark did nothing but publish new content. Slowly he added ebooks and newsletters to the mix before he offered his first product — Teaching Sells. Sharing your content on social media? Subscribing to your blog updates? Writing reviews on their own sites? Taking these actions at a specific time? Spend some time looking at all the ways your audience interacts with and uses your content and products. Look for patterns, problems, opportunities. 4. What are the most-common audience questions and comments? Look at the comments on your blog. Fish through your customer service email bag. Search through your membership site forum. Look at the questions people are asking and comments people are sharing. Create an Excel sheet and keep track of the common questions and comments. Confirmation that your old content assumptions were true and you solved relevant problems. Evidence that those assumptions and problems have shifted. In other words, has the makeup of your audience changed? Are people running into new problems? Are you seeing a pattern in their comments? This is a great opportunity to anticipate needs and develop new content that continues to build your authority in the eyes of your audience. They will see that you’re paying attention to their needs, and pay you back with their attention. And referrals. 5. How will emerging trends affect your content? Looking to the future can be a great source of content ideas. This is why it helps to stay on top of the relevant publications in your industry, keying in on trends. Pay attention to what influencers are saying and read those annual prediction articles. Tackling emerging trends is an approach I’ve used on Copyblogger a number of times. In 2013 it was Google+, 2014 it was native advertising, and in 2015 it is adaptive content. The great thing about this approach is you get to establish yourself early as an authority on these topics if and when they go mainstream. And yes, sometimes these predictions will fail to come true. Or, as was the case with Google+, they come true, but then for whatever reason fall out of favor. It’s a small price to pay for building authority. Besides, research proves that people will continue to listen to people who make bold predictions — even if their track record isn’t perfect. I guess we like backbone. You might be happy with the current results of your content marketing, but don’t rest on your laurels. You didn’t get to this point by taking the easy route — and you’re not going to exceed your current results without working hard. And here’s something to encourage you: it takes about two years for your content marketing to take you from slow, steady audience and authority growth to a sharp, upward trajectory. In other words, it will get better. But you’ve got to stick to it, adjust, and keep publishing. You ready for the challenge? Let us know on LinkedIn.